Scientists in Germany have managed to create the first "intelligent" robotic jellyfish. (Shown above.) According to National Geographic, the Aquajellies use a type of 'swarm intelligence,' to set their own courses, which allows them to come together or avoid each other as needed. They can even 'talk' using light pulses and radio waves. Hmm. I don't trust jellyfish, and I don't trust robots. Nothing good can come of this. Fortunately, there's the story of Winter the dolphin to cheer me up. In 2006, two-month-old Winter was rescued in Florida waters after losing her tail in a crab trap. She survived, but without a tail, she could never learn to swim properly. So world-renown prosthetist, Kevin Carroll decided to MAKE her a tail. (He's also made prosthetics for dogs, ducks, and ostriches.) 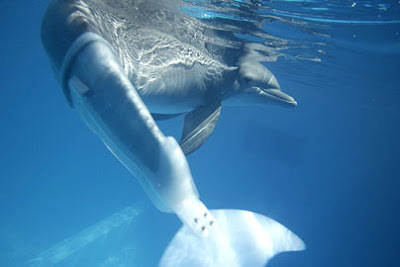 Now Winter holds the record as the world's first bionic dolphin. Read more here. I read a story about a turtle with a fake flipper. I'll find the ink if anyone's interested. ahhh, what will these brilliant scientists come up with next? 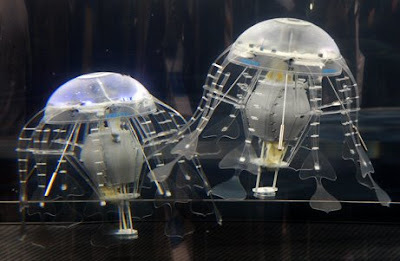 Robotic jellyfish..technology at its finest, i would say. I sense a Saturday morning cartoon series! 'Winter, the Super Dolphin!' Her tail will be able to shoot lasers and enable her to swim super fast. She will fight the robot jellyfish. I should write a pilot and send it to Cartoon Network. Finally! Using technology to HELP the enviroment, and add to it. Instead of killing it. (But of course, the incedent was of human fault). I finally got permission to make a blog! Finally I would connect to other Kiki Strike lovers and comment on the only source for irregularity! By the way, the dolphins are cool! They should make bionic giant squids. what's the point in making robojellies???? and a question, Kiki can drink water, right? otherwise she'll dehydrate really badly from drinking all that coffee. so can Kiki have vanilla essence (or whatever it's called)? and if she can, then she can also have vanilla icecream, if she gets tired of coffee. but she doesn't get tired of coffeee, because it atleast has flavor, compared to gruel. do i ave too much time on my hands??? oh well, Math makes my mind wander! You know, at the Bistro 88 in my town, they have robot jellyfish. But sadly, they are really stupid. Just being blew around by water jets. This is great! Finally the sea is being green! I just found out about the Cans Festival in London, if anyone likes that sort of stuff. Because this is so much better than the usual graffiti which is mainly swear words and illegible signatures. The Winter story is amazing. It's so wonderful! I'm usually not this sappy, but it's really inspiring. I really can't believe it. But the really scary thing is the jellyfish. On the road to making intellegent life, which would be terrible (in my opinion). Sarah: That's awesome! I think graffiti is amazing, but I HATE people who just do swearwords and stuff. They are tainting the name of artists everywhere! Foofoo: That reminds me. I've seen a bunch of stuff that are 'hypoallergenic' or something like that, so would she be able to eat that stuff? Or is she allergic to hypoallergenic stuff? I remember hearing about Winter a very long time ago; and the turtle as well. Welcome Dangerous Irregular to the world of Irregularity on the Net. YaY!